Second Floor Building Plans for new PHS location, 1965. Fifty years ago, PHS was in the process of planning for a move from Philadelphia's Witherspoon Building  to a new (faux Colonial) building at 425 Lombard Street, our current location. 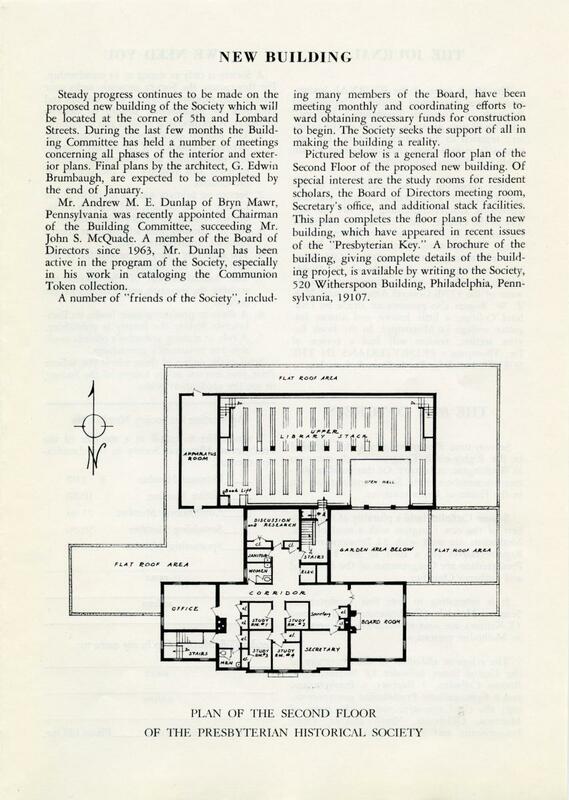 Below is a brief write-up that appeared in the Presbyterian Key, our newsletter at the time, showing the planned-for second floor. The write-up and image were located and scanned by Stephanie Becker, the Society's reformatting technician. There are plans, and then there are plans that get made. Former staff members will have to speak to whether there was a dedicated "Discussion & Research" room or a men's room on the building's southwest corner. In our current set up, those spaces are occupied by our Manager of Technical Services and our Cataloger. From Presbyterian Key, Winter-Spring edition, 1965.